What do we say, to folks who contend that, only by working within the system will you bring the police accountability you seek? Roger David Hardesty, through his own historical research, knows well that a violent Civil War accomplished a great deal. He can’t imagine how much suffering would have gone on, had not the nation outright battled itself over slavery. We can also inform readers that working within Portland’s system has been a decades-long farce. One high-level achievement, following years of organizing and intense public involvement, was the City’s adoption of a Police Plan to Address Racial Profiling in 2009. Then-Mayor Adams fired then-Chief Sizer – for political transgressions – and the plan was never implemented. No subsequent city council has engaged in a requisite annual review of the Plan. Members of the Portland Police Association generally keep mum. The union’s position with city administrators is so secure, their aspirations are easily and repeatedly attained in back-room negotiations, far from policy deliberations television pundits assume you’ll influence. In this post we contend that no one in the City has been in charge of negotiating for reforms the public persistently demands. We do have, in our history, examples of cops taking public positions. In 1981, ten police officers signaled white superiority and intimidation by tossing dead animals at a black-owned business. 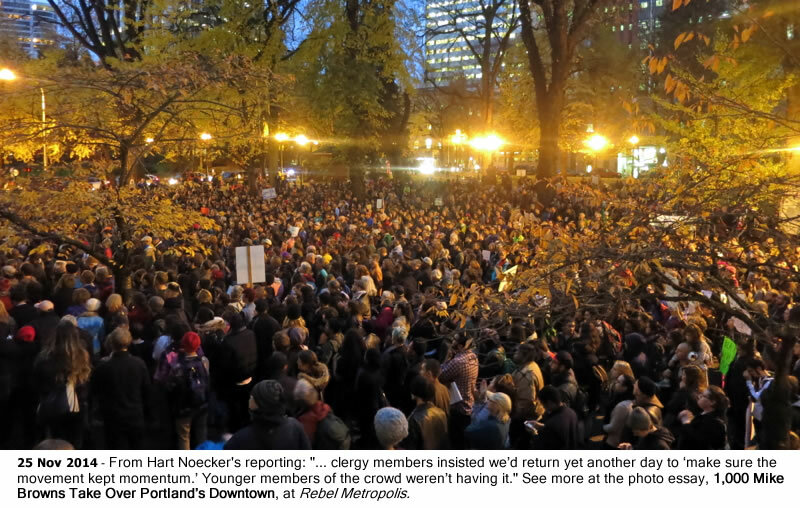 People of conscience took to Portland’s streets (right), following the ‘Possum Incident.’ Two of the ten involved were held to account. They were fired. As for systemic change, an arbitration process – which remains sacrosanct in the City’s current contract with the police union – returned officers Craig Ward and Jim Galloway to their jobs. Portland police took a broadly unified, public stance as the racial profiling plan was to roll out. Wearing matching, police-blue ‘I Am Chris Humphreys’ t-shirts, they marched unopposed through Portland’s public spaces. In 2006, the arbitration process had overruled a 2-week suspension of Officer Chris Humphreys for his role in stomping unarmed James Chasse to death, and then lying to on-scene care providers. 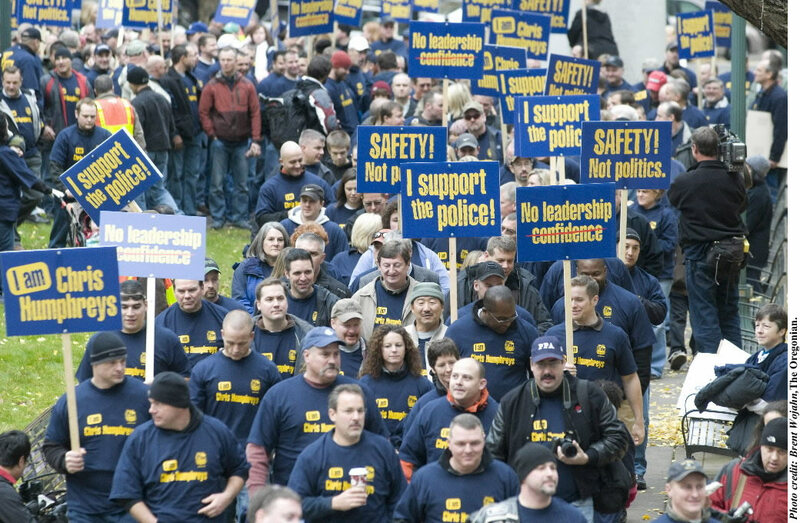 Police marched in 2009 (below), after rising public discourse favored police discipline. Humphreys had fired a less-often-lethal weapon from close range at an unarmed, 12-year-old African American child. The PPA declared Humphreys was “devastated when the commissioner on Nov. 19, 2009, ordered he be removed from the street, with his gun and badge taken pending the investigation.” Mere investigation is an intrusion into police business, said the police union. Without public involvement, the Chief cleared Humpheys in 2010, finding the shooter’s actions within a policy that remained unchanged. The City paid Humphreys to remain off duty (on disability leave) for one year following the first incident. He returned to paid leave from the 2009 assault until after he declared himself a candidate for Wheeler County Sheriff, some five months later. As with the current status of Officer Ron Frashour, paid to stay at home following his 2010 termination – and subsequent, arbitrated reinstatement – for the homicide of an unarmed man in the act of submission during a ‘welfare check,’ the consequences for being terminated in Portland can be quite favorable to the killer. UPDATE: After the Adams administration spent $1,000,000 in legal fees to keep him fired, Portland City Council added 9% interest to nearly two years of back pay and returned Frashour to duty in 2012. In 2016, Mayor Hales prematurely negotiated the police union contract, leaving the arbitration feature (failing since 1981) intact. We offer the example of Rev. Chuck Currie, a social justice leader invested in peace and spirituality. Perhaps roused by local intentions to join national protests against a lack of police accountability, he took note of last week’s plunge into the spotlight by nearly two dozen Oregon law enforcement officers. Officer Richard Storm had used his position in his community – and a badge we gave him (right) – to visually inspire solidarity with another officer evading accountability. Storm posted an ‘I Am Darren Wilson’ meme to facebook. Chief Reese later described Storm’s actions as “inflammatory” and inappropriate, considering the officers expressed their opinions by using the bureau’s official badge. 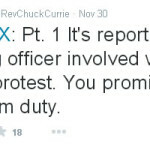 Currie, credibly ensconced in academia, apparently reached out to Mayor Hales, in his role as Police Commissioner. The peace-seeking chaplain is close enough to power to be able to work within the system. Cmdr. Bob Day announced that the three officers (sic) who posted the Facebook images “would not be allowed to provide police coverage at any of the Ferguson-related demonstrations” that had been scheduled. Confused. That’s an initial response mainstream folks take, when local authorities lie to them. 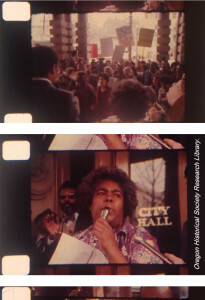 Imagine how few in the 1981 photograph, above, have held faith that working within the system is effective. Authorities lie or break faith regularly, when it comes to law enforcement policy and officer conduct. Those with long memories will recognize Officer Storm. Though redacted by name from DoJ Findings (pg. 17), Federal investigators reported him for severely beating a Spanish-speaking man in the head; for abusing the civil rights of a law-abiding citizen reported missing by a group home that was concerned about his medical condition. Storm might have become a ‘poster child,’ identified as he was (to authorities) as helping form a pattern of illegal police practices. With a responsive community liaison (Hales has plucked a police officer, mid career for that role. He demands those working within the system approach via Officer Wesson-Mitchell. ), a diligent police commissioner might have shown heightened concern that Storm was fomenting divisiveness. Storm’s historical inability to respect civil rights might have assured actual leadership that he was unfit for the duty of protecting free speech and freedom of the press. But that’s not how our system works. We can report that public involvement leads to a greater understanding of all that stands in the way of accountability. This quality of involvement has done little, however, to garner effective oversight. Citizen participation has for generations failed to bring police discipline, training and psychological evaluation into a sphere of public influence. 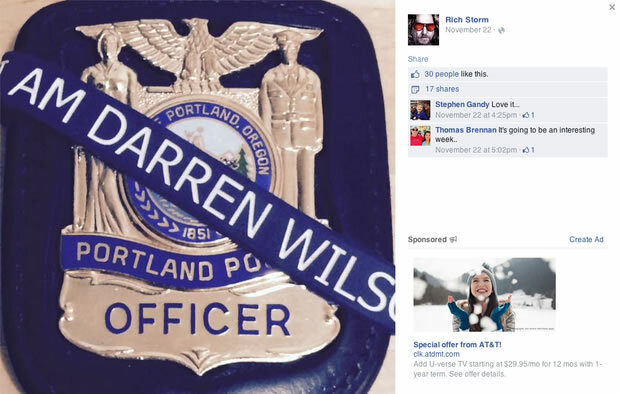 A 24 November facebook post (left) began identifying Officer Storm’s like-minded community. The following day the Willamette Week confirmed their employment status with the Oregon Department of Public Safety Standards and Training. Particularly troubling, to those who seek to work within the system, should be the observation that Storm and his ilk have at least one companion serving in the State’s Department of Justice. 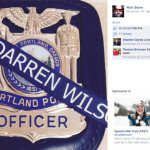 As of this writing, authorities plan on passing Storm, Officers Rob Blanck and Kris Barber (all changed their facebook profiles to use the badge) through a self-exoneration process run out of PPB’s Professional Standards Division. No one will review Cmdr. Day’s false assurances, that he’d not offer lucrative overtime pay to the three singled out. Only the court of public opinion will hold our white city council accountable for breach of truthfulness, and persistently maintaining what the DoJ has termed a ‘self-defeating accountability system’ (Findings, pg. 27). The system folks are encouraged to work within does not identify problem officers, it refutess policy driven by the will of The People: it always leads to police self-exoneration. Un-permitted marches through town can hardly be depicted as violence. We hope that deviating from a long and futile course will bring new leadership and tactics. We can tell you, the City continues with plans to deny justice, and to deny effective civilian participation. A new generation now takes their opportunity to figure out what quality of participation is likely to reform a corrupt City/Police culture. It may not be led by peace-loving clergy.